This delicious ice cream is really easy to make and you don't need an ice cream machine either. Put the apples in a medium frying pan with the butter, sugar and lemon juice. Cook over a medium heat, turning occasionally, for about 10 minutes, then remove from the heat and leave to cool. Fold the lightly whipped cream into the custard then fold in the apple mixture. Spoon into a rigid, covered container and freeze for an hour. Remove and stir well to break up any ice then return to the freezer for another couple of hours until completely frozen. Keep frozen until needed, or for up to 3 months. 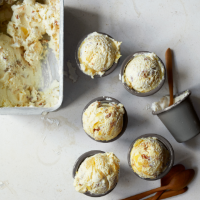 Remove from the freezer about 15 minutes before serving so that it is easier to scoop.